How to crack a young coconut. Do you know how to crack open a young coconut? Well today is your day to find out how! A young coconut is not one of those brown woody shells with the hard meat. That is a mature coconut. A young coconut is cream-colored and is slightly spongy on the outside. Inside it has a clear-ish liquid and a soft jelly like consistency for the meat. The young coconut juice/water is filled with electrolytes and minerals. Young coconuts contain quite a bit of calcium and a ton of potassium! They are easier to digest than mature coconuts too. 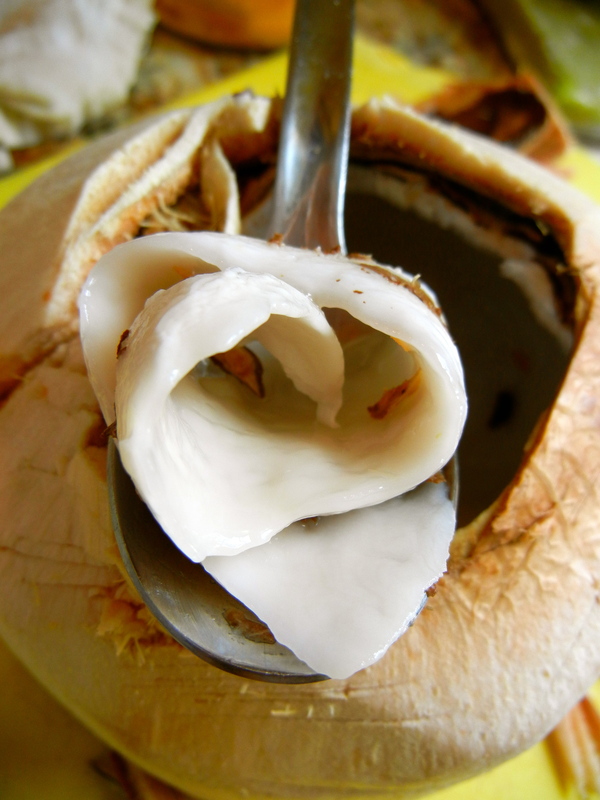 The sugar content in young coconut is medium to high, so you will taste sweetness. Though, this makes it a great base for feeding the cultures when fermenting! ***Introducing my young coconut family…. Baby coconuts: Very jelly texture (falling apart and very thin). Child coconuts: Firm jelly texture (this is a common one and its stage in my pictures). Teenage coconut: Harder texture (but not nearly as hard as the mature coconut, I can still press my finger into it). This just shows you that each coconut is unique! Any stage in my young coconut family works for my recipes. When you are buying a young coconut…. Organic is always best, but I cannot even find organic ones at my coop, so I just get the regular ones. Shake it..do you hear liquid? If you do that is a good sign! If you don’t it probably still has liquid in it. Is my young coconut bad? If your young coconut water is pink when you drain it out, then it is bad. Sorry you will have to dump the whole thing. Bring it back to your store and get a refund (I have had to do this many times). If it smells weird..toss it! I should smell like fresh coconut. 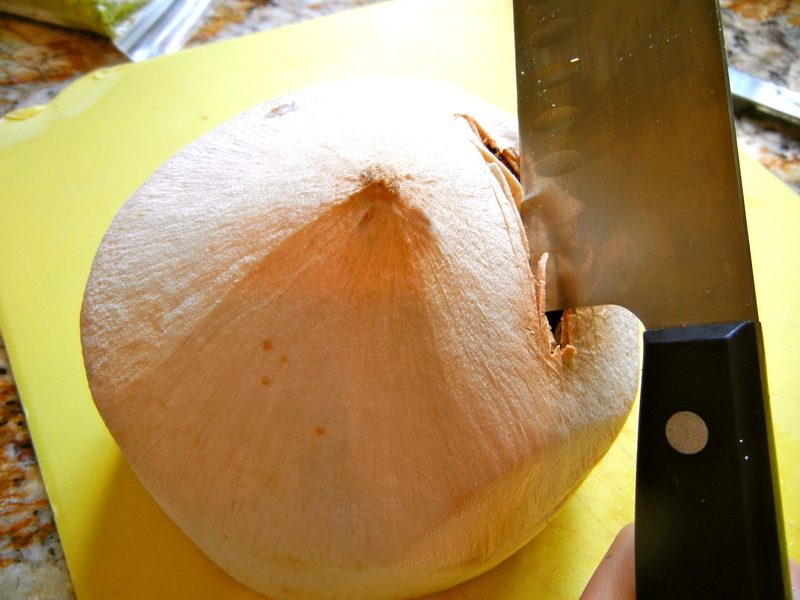 *Warning: this is a little dangerous because you are whacking a coconut with a knife, so make sure no little ones do this please! 1. Cut off the bottom (I use a serrated knife in a sawing motion) until you can see a small soft whitish spot (feel around with your thumb). You might have to do a bit of sawing. 2. Once you see the soft spot, stick the point of your knife into it and the knife should go through the hole. Make as big of a hole as you can with your knife. If you are pressing too hard, then you did not find the coconut’s soft spot. Keep searching! 3. Drain out the young coconut water into a cup or jar and save for later. It should be a yellowish/clear color. I like to use mine for young coconut water kefir! Or just drink it plain or add it to smoothies. 4. Now to take off the coconut “lid”. To get the meat out, flip the coconut upright. Use a butcher knife for this step. Very carefully stab (keep your fingers out of the way) around the point to create a square with the bottom point of your butcher knife. You should hear “crack” once you got through. It might take a few whacks to get the knife to go through. BE VERY CAERFUL! Some force is required for this step. 5. Whewf! You are past the hard part! 🙂 Now you have the “lid” off, so scoup out the soft meat with a regular kitchen spoon. 6. Place the young meat into a bowl and set aside or eat! Yeah!! You did it…that wasn’t that hard, was it? Store extra in a glass jar in the fridge for up to 2 weeks. Store it in a glass container or jar for up to 1 week in the fridge. Freeze it and just deforest it before using it. Add it frozen into smoothies..yumm! Pink coconuts are not bad. this is a common mistake that people make. Think of it as a double yolk egg. the reason it is pink is because of an excess of minerals and vitamins in the water and meat. So unless it’s brown or grayish, or smells bad then its perfectly healthy and okay to drink and eat. Lily thanks for that tip. i always thought pink was bad. well maybe pink spots are still bad-mold.